Cook potatoes for about 10 minutes with olive oil on a skillet over medium heat and season with salt and pepper to taste. Add onions, peppers, and celery to the potatoes and keep cooking for about 5 more minutes until vegetables are tender and potatoes are crispy on the outside and starting to soften inside. While potatoes are cooking, brown the beef in a large skillet over medium-high heat. Season beef with garlic, cumin and oregano. Adjust salt level to taste and keep cooking for about 8-10 minutes. Add the cooked potatoes to the beef, and stir in the tomato sauce, olives, and cilantro. Let sauce come to a boil, reduce heat to medium-low, and cook at a simmer until the liquid has reduced, for 10-15 minutes. Ground beef picadillo is one of my favorite comfort foods because it is warm and full of flavor. I love to make it juicy with some sauce left on the meat so I can then cover a plate of white rice with it. 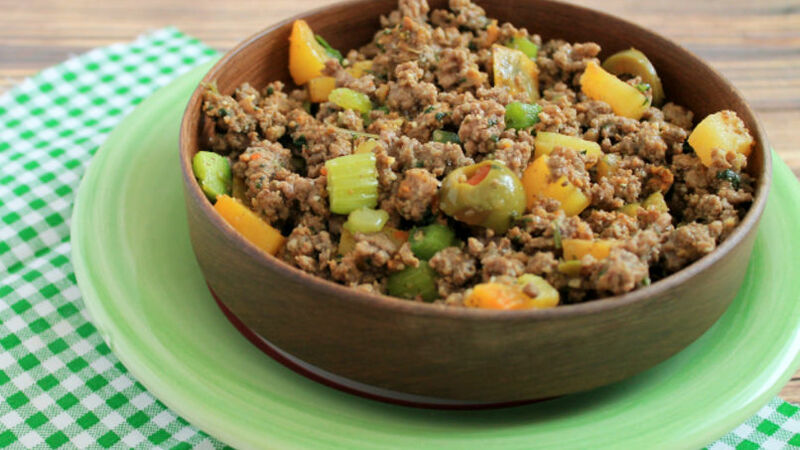 Aside from being served with rice, picadillo many times is also used as an empanada, tamal, or casserole filling.